It's called Business Casual, and it's from Tanis Fiber Arts. I've admired her patterns for a while, and so far it's a great pattern. Provided that I don't screw it up. It usually comes down to a user error for me. And that's okay - I can usually fix it. 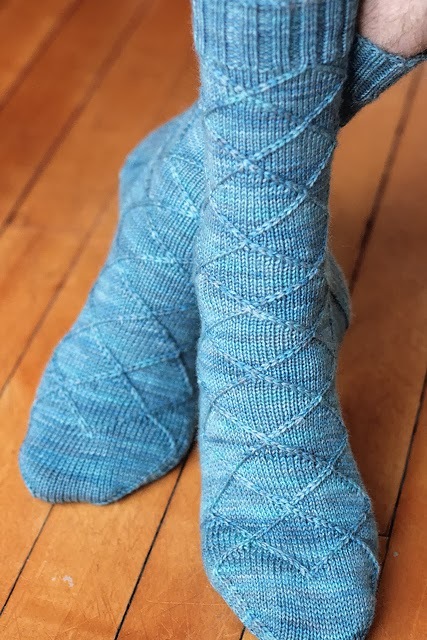 I'm looking forward to having the first one done this weekend, and the second sock may get delayed a bit, as my busy time at work is coming up, and that means late nights and not a whole lot of knitting time. In other news, Princess' tooth is fine, and Little Man lost his very first tooth today! My babies are growing up, and it's wonderful to watch. What have you been doing the past couple of days? Have you been staying warm and wearing woollies, or just knitting them up?